Joss and his Bladebound brethren have worked hard to earn their paladero training, from battling bloodthirsty witches and monsters to hunting down a gang of vicious kidnapping pyrates. But when the three friends travel to Hero’s old order, Blade’s Edge Acres, to continue their training, they are faced with a new challenge: Hero’s mentor, Lord Haven, is dead. And it looks like he may have been murdered. As the trio investigate Haven’s death, they uncover a sinister plot that threatens all of Thunder Realm. But with dark figures circling ever closer, do the three young prentices have any chance of saving the kingdom – let alone themselves? In the third instalment of this brilliant fantasy series by Steven Lochran, readers are taken on a wild adventure through the kingdom of Thunder Realm. Perfect for fans of Diana Wynne Jones and the Ranger’s Apprentice series by John Flanagan. “A gripping blend of action, technology and Jurassic fantasy!” – CBCA Reading Time’s praise for The Riders of Thunder Realm, the first in the PALADERO series. Joss has always wanted to become a paladero, and now he finally has that chance. But before he can start training, the town is attacked by vicious pyrates who abduct half the villagers, including Joss’s best friend Edgar … and then vanish into thin air. The thrilling second book in the hit Paladero series. “Totally thrilling and impossible to put down!” – Michael Grant, New York Times bestselling author of the GONE series. Download Vanguard Prime: Red Alert, the free eBook featuring a whole new adventure, from the Penguin website. Meet the Vanguard Prime team here. Listen to the Vanguard Prime theme song on Youtube. Tokyo is set to explode when cyborg soldiers declare war on Vanguard Prime. Battle lines are drawn and old friends may actually be secret enemies. Will the Japanese superheroes of Battle Force Zero come to the team’s rescue, or will they join the attack? – “Lochran really creates a world where these guys could exist quite convincingly…I know there will be lots of loyal readers hanging out for the next instalment!” – Worth Reading? Worth Sharing! 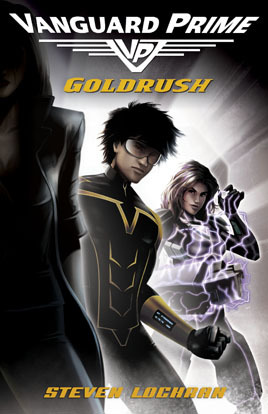 When a villainous organisation puts out a Kill Order on the Knight of Wands, Goldrush gets caught in the crossfire. What dark secrets lurk in the Knight’s past? And will the two heroes survive the night? – “Wild Card is a good read. Fast paced and entertaining, but with some depth to what could easily have been cardboard cut-out characters. And as a bit of a pop culture junkie, I loved all the references that Lochran has peppered this story with — from Comic-Con to Star Wars…Vanguard Prime is a great series to hook in reluctant readers.” – Author George Ivanoff. – “Vanguard Prime are well written, modern sci-fi, adventure books with a quirky sense of humour and plenty of action.” – The Little Bookroom. 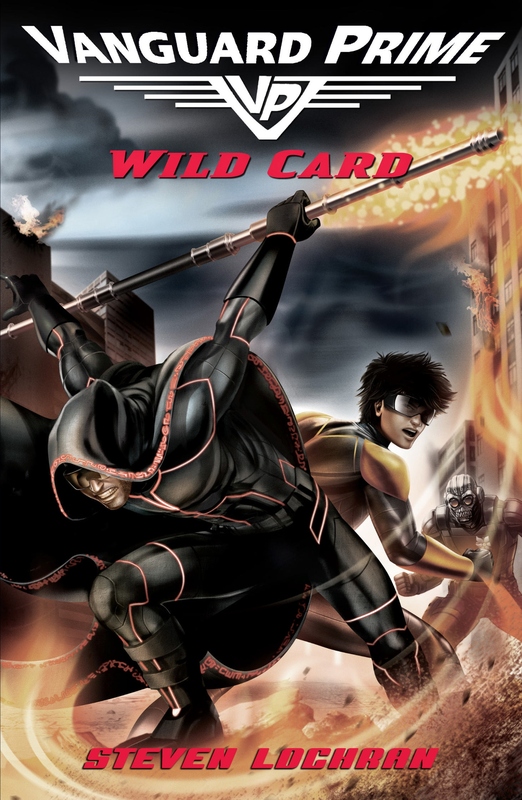 – “[Wild Card is] a book that, like the Percy Jackson books, combines quick-draw pacing with intelligent, self-aware humour and a wonderful sense of the humanity that is underscored by its super-human characters…Brimming with imagination and wit and with pacing so fast that you’ll be in pain from the G forces, Wild Card is a overall thoroughly enjoyable addition to the superhero genre.” – Read In a Single Sitting. – “[5 out of 5 stars]Another action-packed, full-on, wild ride of a storyline, with surprises and unexpected turns of events all popping up all over the place. Highly recommended for action fans – or those who love superheroes.” – Catherine, Goodreads. – “The Vanguard Prime series is a classic heroes and villains tale for readers aged 10+…While this is marketed as a boys’ book series, the girl heroes – with their own twisted personal journeys to power – are every bit as important as the boys. Very much in the comic book superhero tradition, this is a dark series, though no more graphic than PG films and games enjoyed by the same age group, and gives every reader the chance to imagine what it might be like if they woke up one morning with unimaginable powers!” – This Charming Mum blog review. – ‘I loved Wild Card even more than Goldrush…. The book hooked me in straight away. I read it in two days and it had a cliffhanger at the end of every chapter.’ – Marcus from Eltham. Elite superhero team Vanguard Prime has a new recruit. Sam Lee was just a normal teenager . . . until the disastrous emergence of his superpowers. Now he has the chance to join his childhood heroes and become the youngest-ever member of Vanguard Prime. But when the time comes, will Sam have what it takes to save the world? Read an extract from Vanguard Prime: Goldrush here. – “Superheroes, pop culture references and a fast-paced story combine to make an exciting and easy reading experience…All up, Goldrush is a fun and exciting read. I’ll certainly be ordering the next instalment, Wild Card.” – Author George Ivanoff. – “Goldrush is an interesting meld of traditional comic book archetypes in a traditional novel format…All wrapped up with a great sense of humour.” – Centre for Youth Literature. – “There is never a dull moment in this first book of Steven Lochran’s Vanguard Prime series…A terrific Sci-Fi/Fantasy series from an Aussie author who clearly has many more stories to bring us.” – Worth Reading? Worth Sharing! – “[Recommended] for all superhero comic book readers as well as young readers 10 and up.” – BenLangdon.net. – “I LOVED this book!…fast paced and exciting and I stayed up until 11.30pm to find out what happened in the end.” – Mummy Ate Me. – “Non-stop, unrelenting action sequences…Will prove to be a popular addition to the fiction shelves, particularly with young male readers.” – Russ Merrin, Magpies magazine. – “Pacy…plenty of teenage humour…Lochran’s thorough approach to constructing his superhero world pays off.” – Fiona Purdon, The Courier Mail. – “Think CHERUB, Alex Rider and Artemis Fowl all rolled into one…then you’ve got Vanguard Prime!” – DMAG. – “Vanguard Prime: Goldrush is a funny, stylish and action-packed read.” – Jack Heath, author of Money Run, Hit List and the Agent Six of Hearts series. – “…strong male and female main characters, with an action packed storyline that both boys and girls will enjoy.” – Michelle, Lamont Book Reviews. – “4 out 5 stars…Recommended for everyone who enjoys comics, superheroes and action, and is clearly destined to be a perfect present for reluctant readers and middle grade boys.” – Miss Possum’s Book Reviews. – “Sam is a character we can all get behind – the plot is fast-paced and, along with the fact that the elite squad contains some strong and capable female superheroes, I’m more than happy to recommend this to readers of 10 and up.” – Emily Gale, Readings website. – “This series promises to be fun. Looking forward to book 2.” – Lowly’s Book Blog. 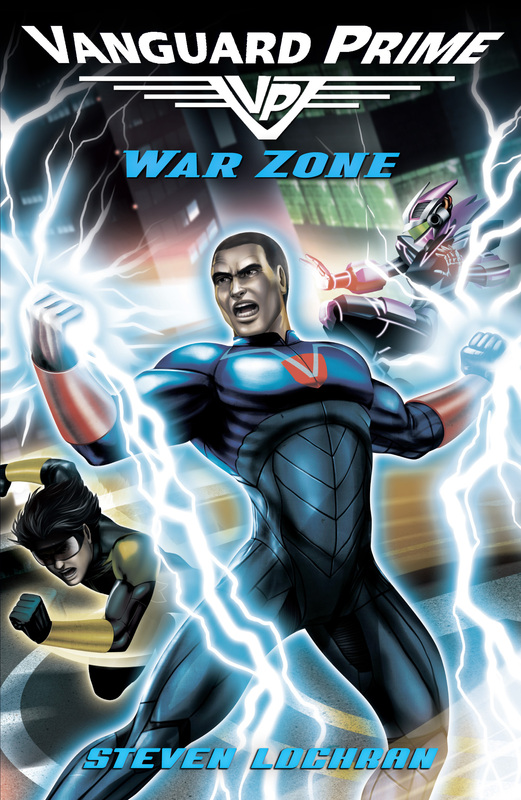 Vanguard Prime: War Zone (Book 3) to be released in September 2013. Haven’t found what you’re looking for? Try the FAQ page! Thanks, Nathan. Glad you liked it! When’s the next book going to be released? Wish I could tell you, Tom. I have a third of it written but Penguin wants to see how the series goes before committing to another one. If you’re a fan of Vanguard Prime and want to see it continue, I’d recommend telling as many people about it as you can. Hopefully we can get some word of mouth going. In the meantime, thanks for writing in! I love the Paladero series can’t wait for more! Thanks! The new book is out in February. Hey love the amazing book!!!!! Hi, Em! Thanks so much for getting in touch, as well as for the kind words. I can’t tell you how much I appreciate it, especially heading into the hard work of editing Book 3. Hopefully I should have some more news on that front soon. I’d also like to wish you the best of luck with your writing. Your post has inspired me to write some more articles focusing on worldbuilding – let me know if there’s anything in particular you’re curious about or any details you’d want included. When will you be releasing Paladero Book 3 too Australia? Happy to say that Book 3 will be released in Australia in the next few months, with the title and cover to be revealed very, very soon! When will book 4 happen in 2019 or 2020? Book 4 is currently set for a 2019 release and I’m writing as fast as I can to make sure that happens. I don’t want to keep anybody waiting longer than they have to!